What does this man know that the Ukrainian Military has yet to realize? Some may say this is body language of laziness - they would be wrong. In this context in particular it is a significant alpha display. 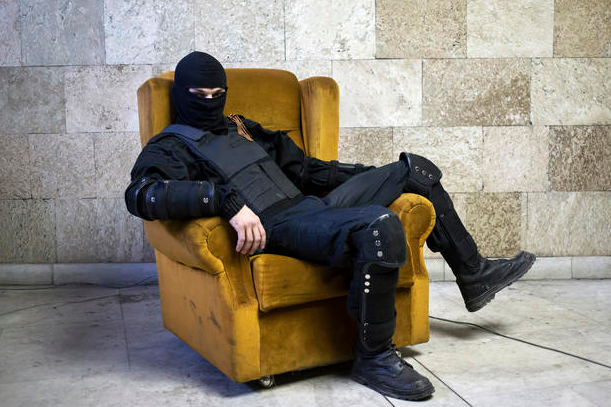 This Russian "separatist" is inside a regional government building in the City of Donetsk, Ukraine. This nonverbal configuration is indicative of "ownership". It speaks to his confidence and emotional comfort and his anticipated success of Russia annexing eastern portions of Ukraine. It also tells us that there is no one who out-ranks him in the room. What other key thought-feeling does his body language indicate?